Last week was a good pen week, and one of the pens that made it so was The Bolt, by KarasKustoms. I backed their first pen project, the Render K, and was so pleased with that pen that it was a no-brainer to back this project. KarasKustoms sets the bar pretty high when it comes to Kickstarter projects. They provide regular updates that often contain videos of the machining process. 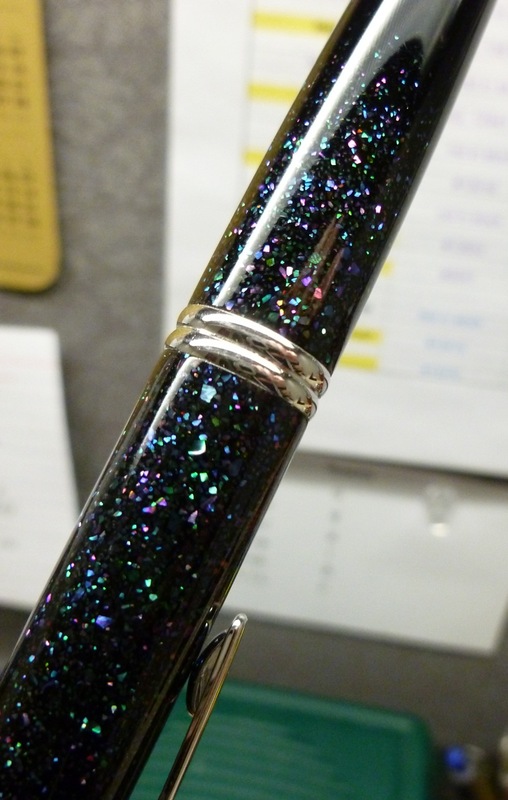 (I’m oddly fascinated by these glimpses of the birth of a pen.) The shop truly brings you along for the ride and provides a very transparent experience. I haven’t backed a project that’s done it any better. Like the Render-K, the Bolt is available in both aluminum and brass. I chose aluminum, as I did for their first project, and am again pleased with my choice. The pen has heft but is not heavy. The weight is just perfect for me. 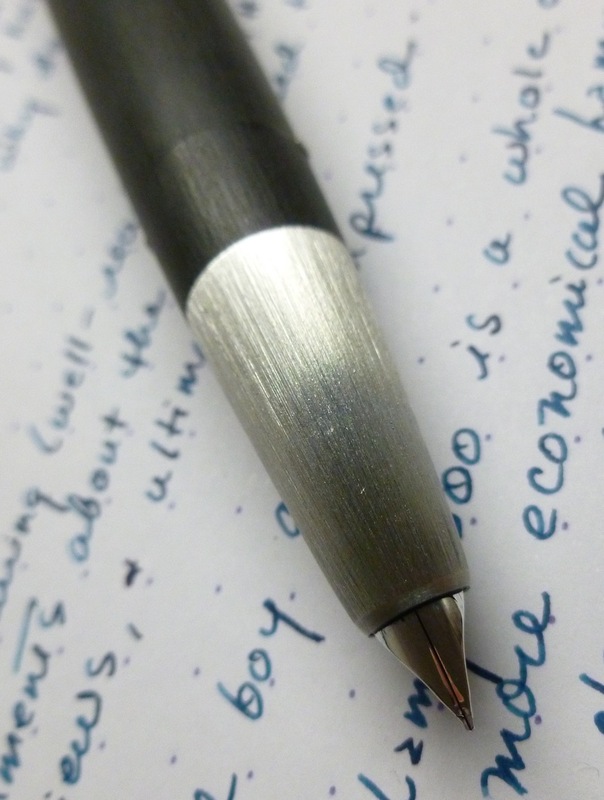 The pen measures 5.5″ long and 0.45″ in diameter, and feels great in hand. I’d consider it well-balanced and comfortable. 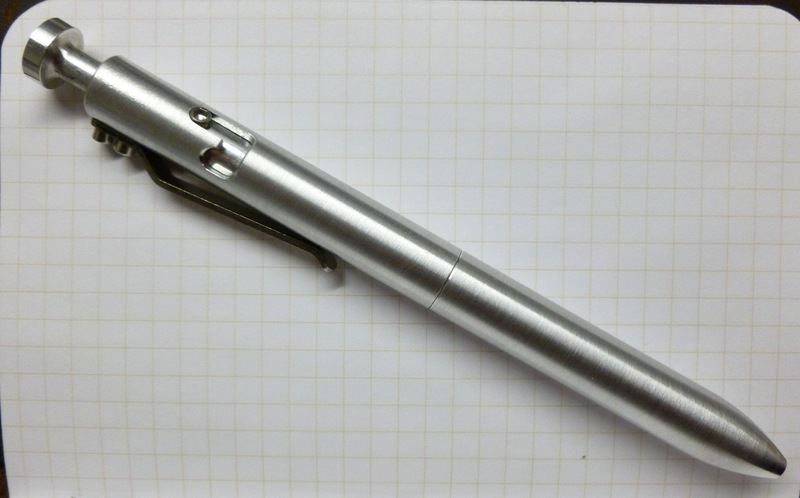 Unlike the Render-K, this pen is retractable, and that’s where things get particularly cool. 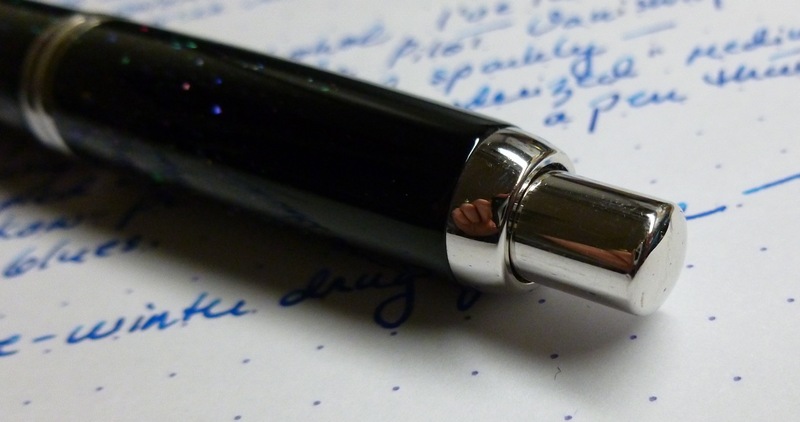 To extend the writing tip, you push down on the knock, as you would for any other retractable. But THEN, use your thumb to twist the knock to the side so that the bolt continues to travel in the machined slot, and the extended writing tip is locked into place. (At first this action took two fingers, but now that things have loosened up, I can do the whole thing with just my thumb.) I don’t know why this is fun, but it is. It is. 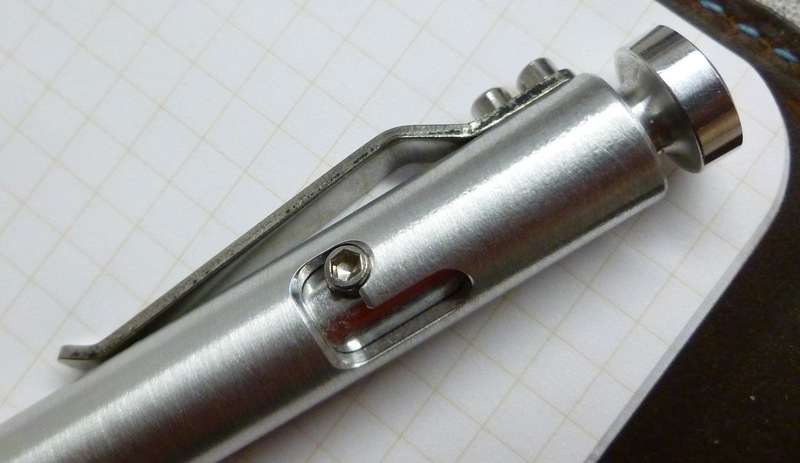 The pen comes with stainless steel hardware, AND an Allen wrench so that you can tighten the clip’s screws, if need be. (Have I mentioned that these guys have an eye for detail?) 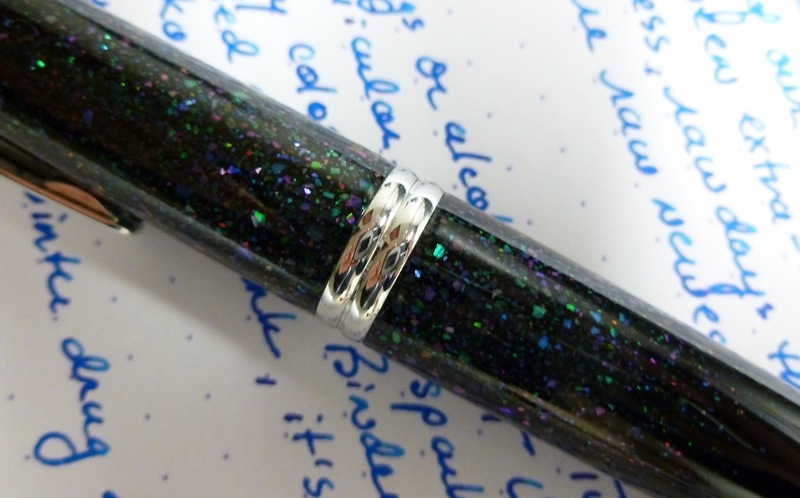 The clip on my pen hasn’t budged, but it’s nice to know that I can tighten it up if I have to. I have nothing but praise for the team at KarasKustoms. The Bolt is solidly made, and sports clean lines and a cool industrial look. And that bolt mechanism? It’s irresistible. Keep ’em coming, KarasKustoms. Keep ’em coming. Want your own Bolt? 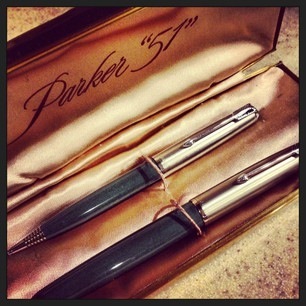 Though the Kickstarter project has ended, the pen is now available via the KarasKustoms website. Check out all of their cool products by clicking here. I was not compensated in any way for this review. I’m just a fan, and wanted to spread the word about this interesting pen and the quality workmanship. If there’s ever a month that requires a pen pick-me-up, it’s February. And this last one was particularly grey, in weather and in mood. 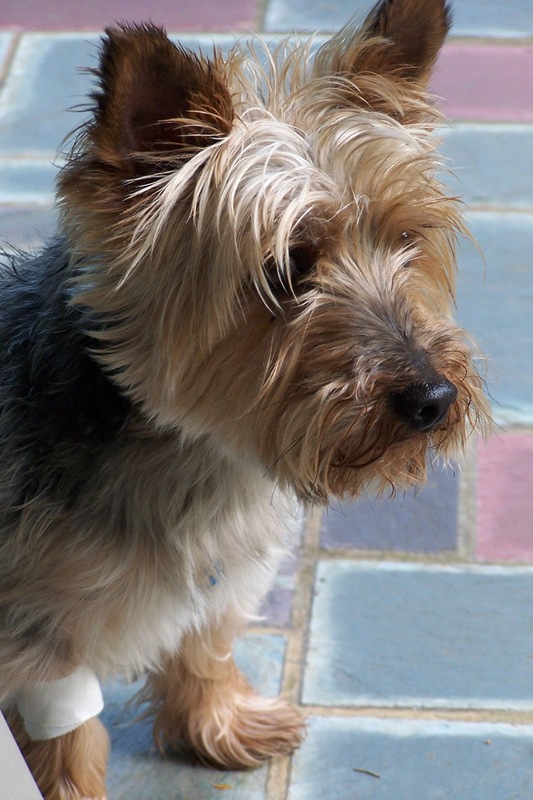 One of our beloved pups (11 year old Boo) has been struggling a bit so we’ve been extra-anxious about him, which made the colorless skies and raw winds that much harder to bear. Basically, we’re raw nerves in need of brighter days. Rather than cope with…ummm…”substances,” I’ve turned to pens. 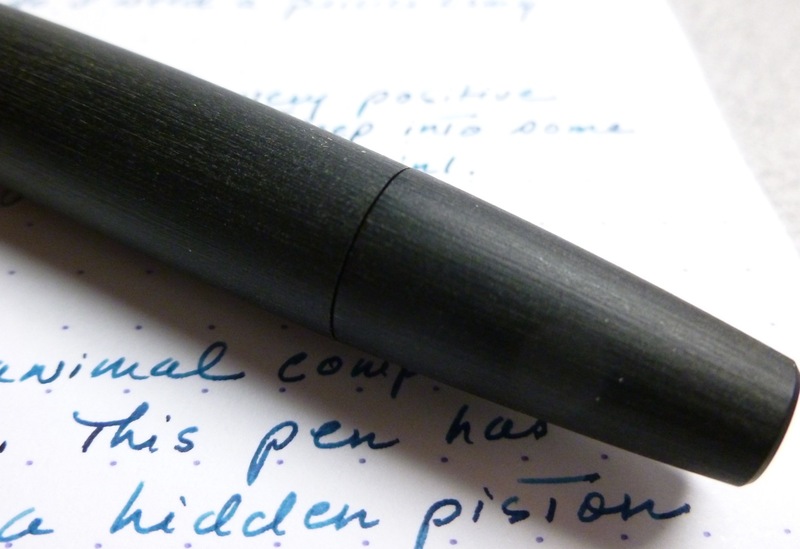 Well, one pen in particular– the Namiki Raden Vanishing Point that I picked up used from Dan Smith back in January. 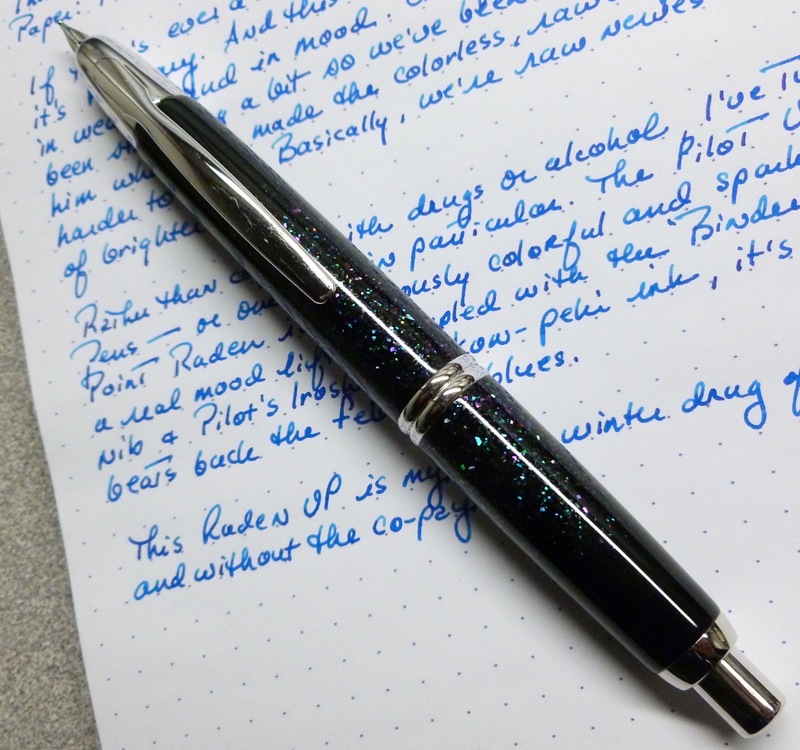 With it’s black lacquer body and heavy sprinkling of gorgeously shimmering abalone chips, the Namiki Raden Vanishing Point is good for what ails ya. It’s stunning, but not flashy. Colorful, but not blingy. The teal, purple, pink, azure, and emerald abalone chips almost look like they’re floating beneath the surface of the deep black body. When you consider the fact that each chip was placed by hand, it’s impossible to not be impressed. Mesmerizing, is what it is. Just like a starry starry mid-summer sky. The pen came with a medium nib, but I found that it had a bit of “tooth” to it, so I made the decision to purchase and swap in a “Binderized” medium nib unit. 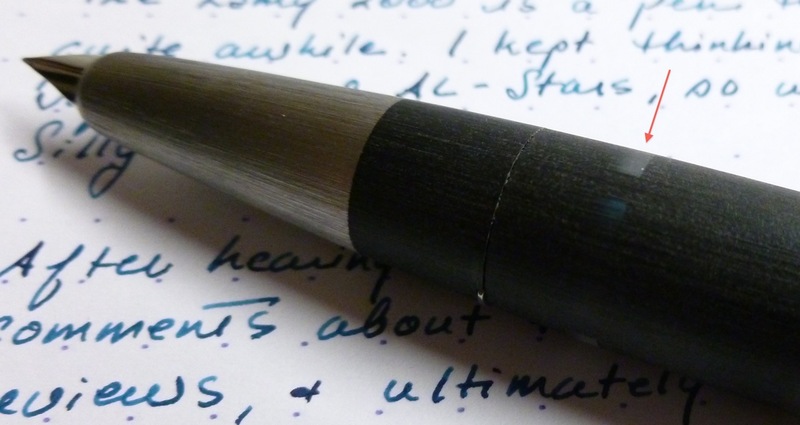 A pen this good-looking deserves a stellar nib. And stellar it is. 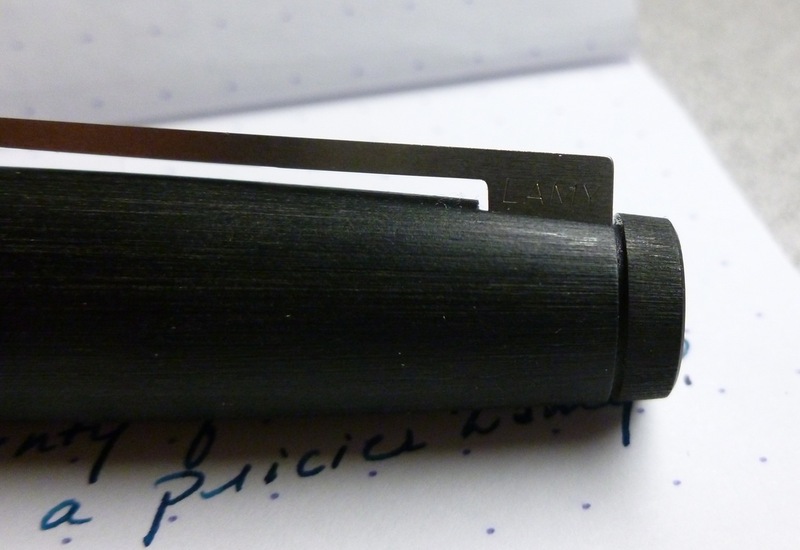 A “Binderized” nib is tested and tuned by Nibmeister Richard Binder…not customized, but optimized. Simply put, Richard Binder works magic with nibs. Magic. And let’s not forget that this is a Vanishing Point, which adds another level of coolness. 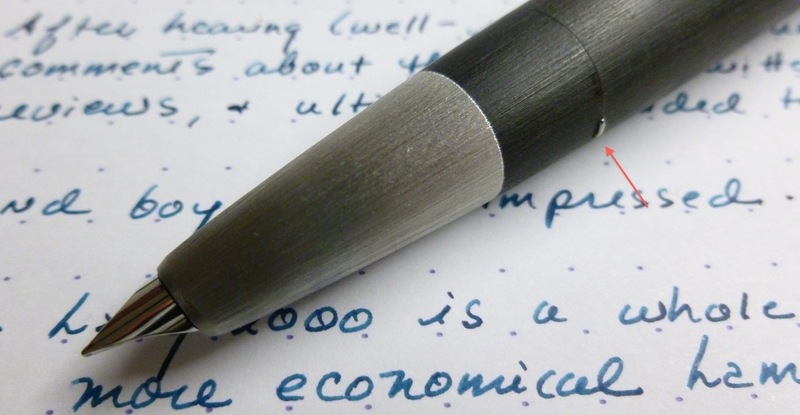 By clicking the rock-solid knock, the nib is deployed or retracted, just as easily as with a retractable ballpoint pen. Click. You’re writing. Click. You’re not. Dead simple. 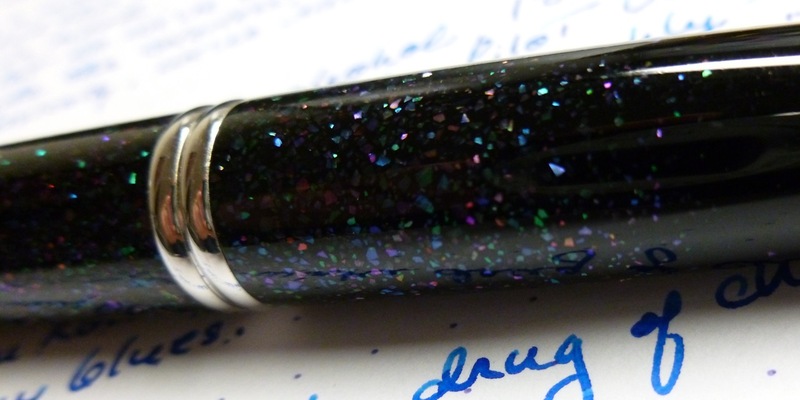 I filled the pen with Pilot Iroshizuku’s kon-peki (Ocean Blue) which works beautifully with the abalone accents. It’s a match made not in heaven, but in the ocean. Very soothing. Which is great because remember? Raw nerves? I will admit to a bit of a break-in period with regard to the clip placement, but all is well now. I have a pretty typical grip, I think, so if you don’t, you might want to try one before jumping into the Vanishing Point pool. That’s one quirk with this pen that might be a negative for some. So this pen did the trick, and beat back the February blues. 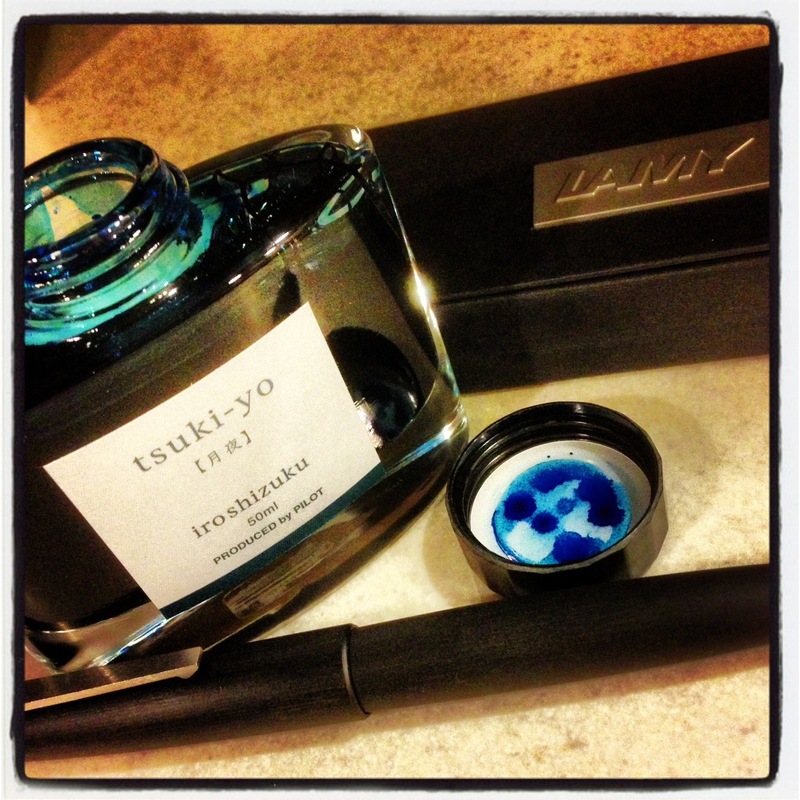 Apparently the Namiki Raden Vanishing Point is my drug of choice…and without the co-pay. But you know what REALLY cured me? Little Boo, back on his feet. Some things are more important than pens. 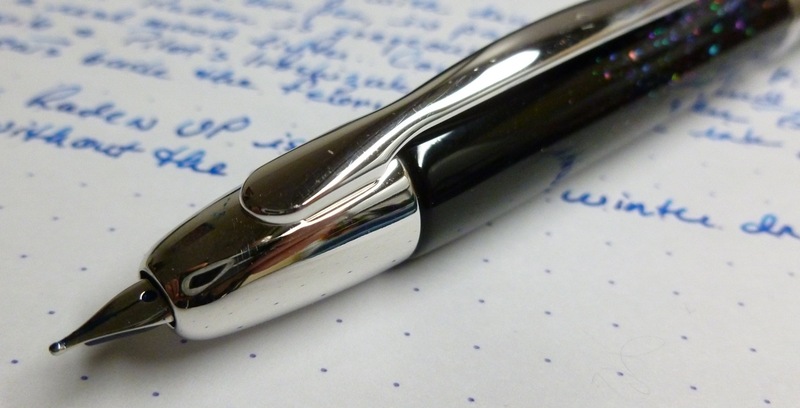 Check out another review of the same pen at Gourmet Pens. Want to know more about this fabulous ink? Check out Brad’s review.